I’ve mentioned my ardent love for the Big Bone Room at BYU before. 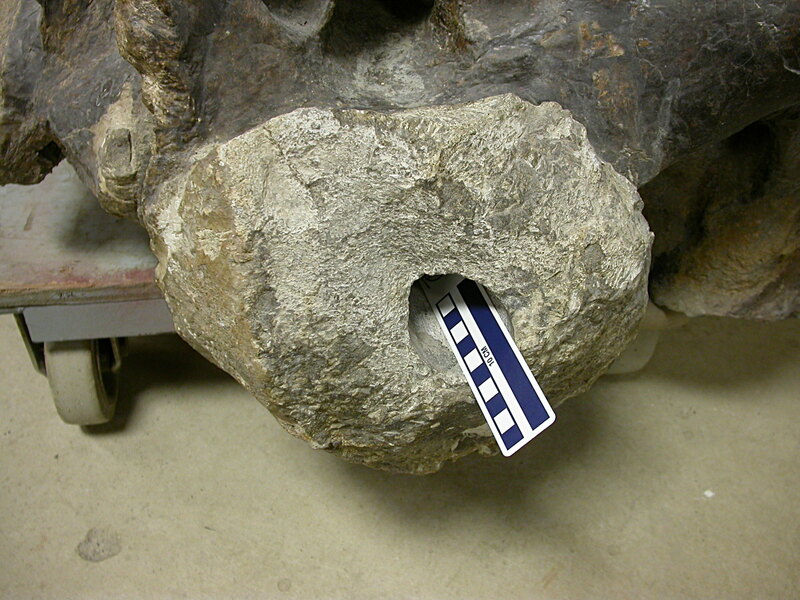 One of the cool things that you can find there and nowhere else is BYU 9047, the holotype of Cathetosaurus lewisi, referred in 1996 to Camarasaurus. In referring to the beast as Cathetosaurus in the title I’m not casting aspersions on that referral. I’m just wondering. Other ‘camarasaurids’ have been promised from time to time, but so far none have panned out. So for now it’s just Camarasaurus….but. With all the species floating around out there, Camarasaurus is getting to be a pretty big tent. I wonder if this most common of American dinosaurs will continue to be a single genus forever, or if new discoveries and reanalysis of old material will break it up into several. Anywho, I spent some quality time with BYU 9047 when I was in Utah in 2006, on my last or next-to-last dissertation data-gathering trip. As always, I was keeping an eye out for pneumaticity and especially for pneumatic hiatuses. And I got pretty darn excited when I took this photo of the C. lewisi sacrum in right lateral view. As you can see, it has a foramen on the last centrum, but not on any of the preceding centra. Pneumatic hiatus city–lookout Nature, here I come! I approached with shuffling steps and ‘bated breath. The acolyte of an eldritch cult, I knelt in the dust before the object of reverence, ducked my head beneath the vasty sweep of its sacral yoke, and dared to poke a finger into the holy of holies. Inside it was….smooth. Like, freakishly smooth. And perfectly tubular. In Bill, the Galactic Hero: On the Planet of Bottled Brains, Harry Harrison wrote that “Nature cares nothing for equilateralism, and indeed has a hard time drawing a straight line” (oh yeah, I just went there). What is true of straight lines is true in spades of perfect cylinders, especially in the asymmetric osteological playgrounds of sauropod vertebrae. Like cold fusion and cheap mortgages, the foramen was Too Good To Be True. At some point someone must have planned to mount BYU 9047, but AFAIK it was never actually put up. Must have gotten pretty close, though, because they went to the trouble of drilling a long core out of the sacrum, presumably to house a steel support rod. And the coring wasn’t perfect, either–the borehole nicked the right wall of the last centrum, producing the pseudoforamen that got me all hot and bothered for about 180 seconds. The above photo shows the entrance to the tunnel at the front end of the sacrum. You can look down this hole and see light shining in from the pseudoforamen in the last sacral (the hole does not extend all the way out the posterior end of the sacrum). Somehow I had completely missed it while wheeling the sacrum out, sketching, and taking the first round of photos. So much for the vaunted powers of observation. You know what this is like? Everyone’s first dig, where they’re running to the dig leader every five minutes with a piece of “bone” that is actually leverite (as in, “leave ‘er right there”). This was my dry well, my leverite mine, my fool’s gold. P.S. Check out how the neural spines all lean together so that they cover much less ground, antero-posteriorly, than the centra. 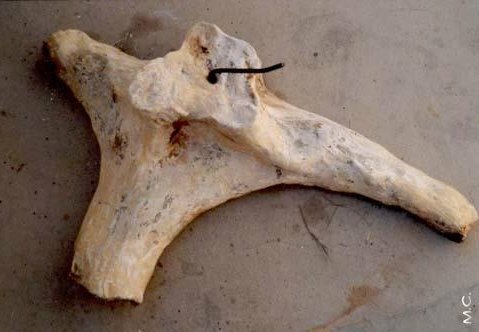 I don’t think it’s distortion–the whole sacrum is in pretty good shape, pretty symmetrical, no obvious crushing or shearing. ‘Sup with that? So, 2008 has come and gone. 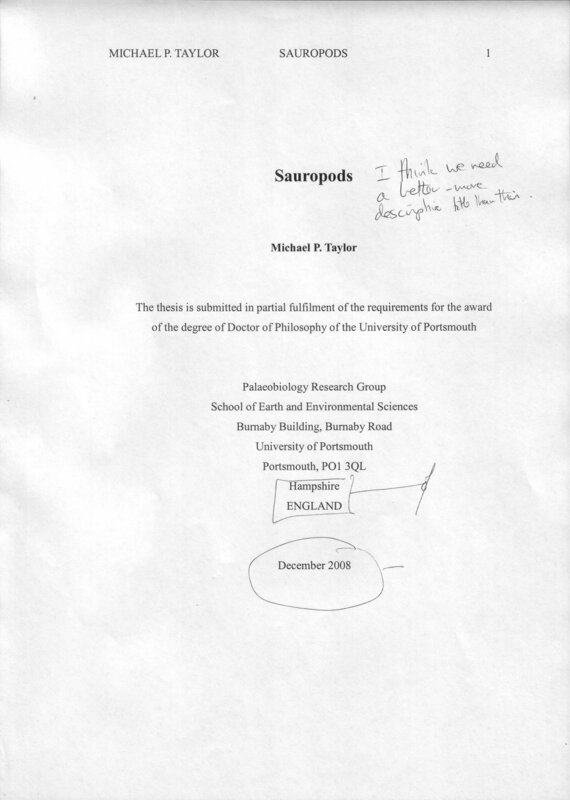 Was it a good year for sauropods? In terms of new taxa, it wasn’t amazing, but it wasn’t too bad, and (as we’ll see in this and a few following posts) some of the taxa involved had pretty interesting vertebrae. For the record, the taxa named in 2008 were Dongyangosaurus sinensis Lü et al., 2008, Eomamenchisaurus yuanmouensis Lü et al., 2008, Qingxiusaurus youjiangensis Mo et al., 2008, Muyelensaurus pecheni Calvo et al., 2008 (labelled 2007, but actually 2008), Uberabatitan riberoi Salgado & Carvalho, 2008 (previously covered here on SV-POW! ), Dixiatitan binglingi You et al., 2008, Pitekunsaurus macayai Filippi & Garrido, 2008, Tastavinsaurus sanzi Canudo et al., 2008 (previously mentioned here), and Malarguesaurus florenciae González Riga et al., 2008 (labelled 2009, but actually 2008). Hold on – that’s 9 new taxa. Wow. I’m not going to look at these taxa in any particular order, nor will I be covering all of them (and if there are any I’ve missed, please let us know). We start with one of my favourites: Dongyangosaurus from the Fangyan Formation of Dongyang, Zheijiang Province, China. 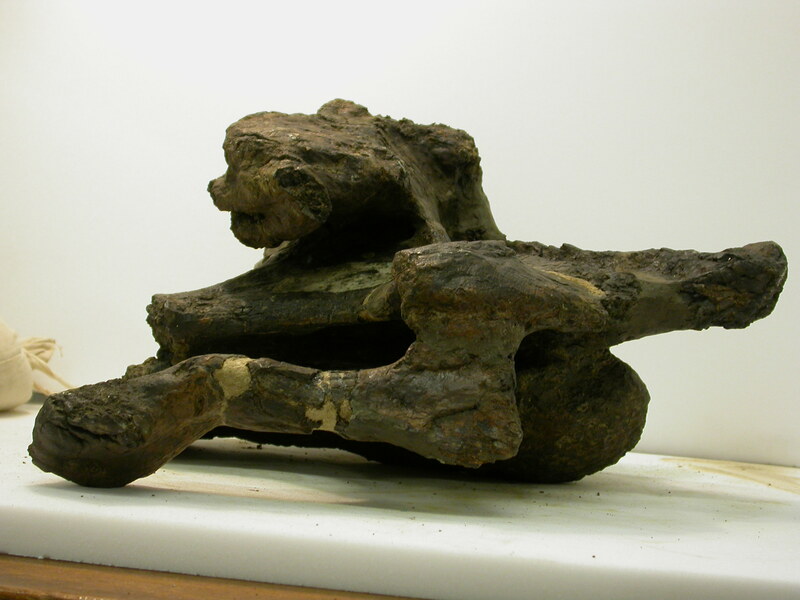 A (probable) non-titanosaurian titanosauriform, its partial skeleton includes beautifully preserved vertebrae (Lü et al. 2008). 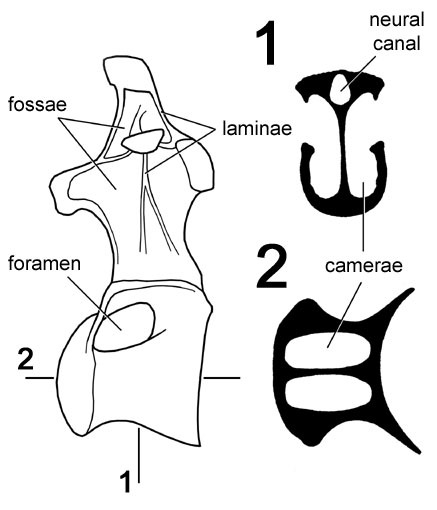 The dorsals [shown here, Plate I from Lü et al. (2008)] are neat. The neural spines are described as bifurcate, which I assume means that they are V-shaped at their apices as they are in, say, Camarasaurus or Opisthocoelicaudia: unfortunately this is neither clearly described nor figured in the paper. Prominent spinodiapophyseal laminae (spdls) extend obliquely up the sides of the neural spines, but what’s really odd is that there are deep hollows dorsal and/or posterodorsal to the spdls: these hollows house small subsidiary laminae. The presence of these ‘hollows with subsidiary laminae’ is unique to Dongyangosaurus. At least some of the dorsals also possess – in addition to anterior and posterior centroparapophyseal laminae and paradiapophyseal laminae – subsidiary laminae ventral to the diapophysis and posterior to the parapophysis. What’s the deal here? Are those cavities on the sides of the neural spines pneumatic? We’d need detailed information on the bone texture here to test this hypothesis. And why all the extra little laminae? Given that laminae seem to help partition air sacs, the presence of small subsidiary laminae hint at the possibility that Dongyangosaurus went nuts (in pneumatic terms), growing lots of extra pneumatic structures in and around the neural arch. 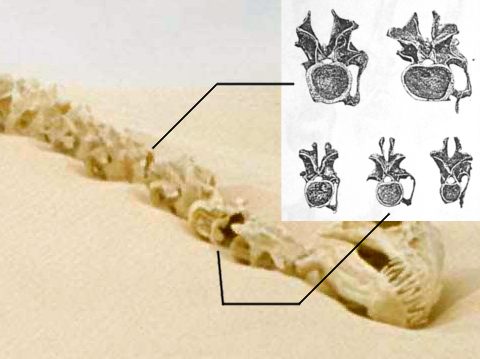 The two preserved caudal vertebrae [shown below, Plate II from Lü et al. (2008)] also reveal some interesting strangeness. The caudal centra are taller than they are wide, and are amphicoelous (concave at both ends). The bases of the postzygapophyses (in an area bound anteriorly by the spinodiapophyseal lamina and ventrally by the postzygodiapophyseal lamina) are perforated by three small fossae, all of which presumably invade the base (at least) of the postzygapophysis. Again, this is unique and used as a diagnostic character for the taxon. And – that’s it. Another one next time. Lü, J., Azuma, Y., Chen, R., Zheng, W. & Jin, X. 2008. 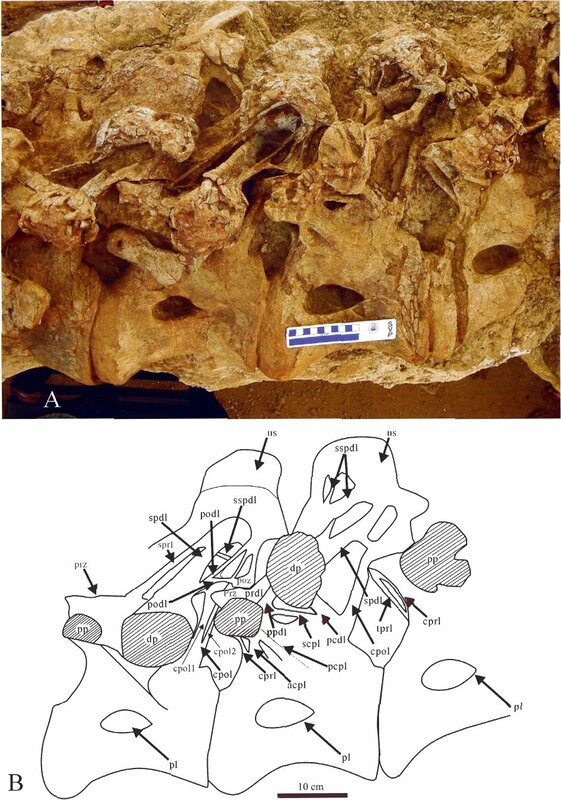 A new titanosauriform sauropod from the Early Late Cretaceous of Dongyang, Zhejiang Province. Acta Geologica Sinica 82, 225-235. Just got back my supervisor’s comments on my draft dissertation front-matter. Looks like I’m not going to be able to go with my chosen title. It’s not in super-great shape, but this about as good as Wealden cervicals get: for some reason, dorsals seem to fare better in the preservation stakes. I’m not going to attempt even the most tentative ID for this. I’m sure Mike will deride this as sordid linkbait, but what the heck. I’ve been meaning to blog about the sauropods of Star Wars for a while now, and I was finally spurred into action by this comment over at TetZoo. 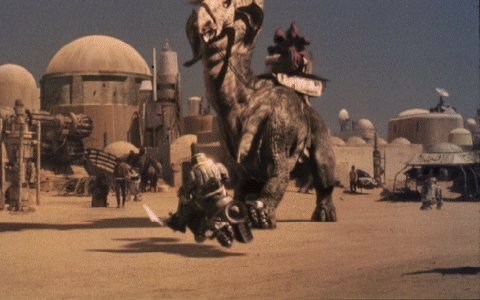 The first (and best) sauropod of Star Wars will be no surprise to anyone with reasonably sharp eyes and rudimentary knowledge of sauropod osteology: the Krayt dragon skeleton that C-3PO walks past on Tatooine is composed mainly of cast sauropod vertebrae. You can see that the monster’s cervicals have big cervical rib loops. The deeply bifurcated neural spines mean that they are either from a diplodocid or Camarasaurus. Some of them are also fairly long and low-spined, especially those close to the head, which rules out Camarasaurus. I find the purely fictional skull pretty unconvincing next to the real (cast) sauropod vertebrae. Moving on down the series, we see that all of the dorsals have high neural spines, some of which are deeply bifurcated, which again is consistent with diplodocids but not with Camarasaurus, whose bifurcated spines are all short (and fairly ugly). The vertebrae also have broad transverse processes that give them a ‘t’ shape. 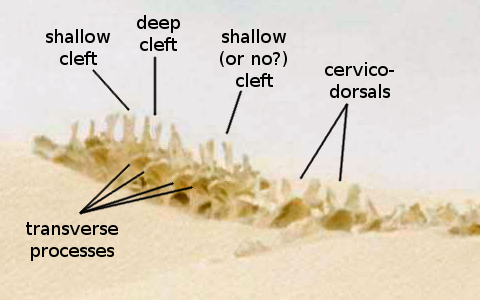 You can see that whoever laid out the dorsals scrambled their order (perhaps deliberately) so that the deeply cleft vertebra in the middle is bordered ahead and behind by verts with little or no bifurcation of the neural spine. In articulated diplodocids, the neural spine cleft first appears in the anterior cervicals, grows larger and deeper through the rest of the neck, and then disappears around the middle of the dorsal series. So which diplodocid is it? 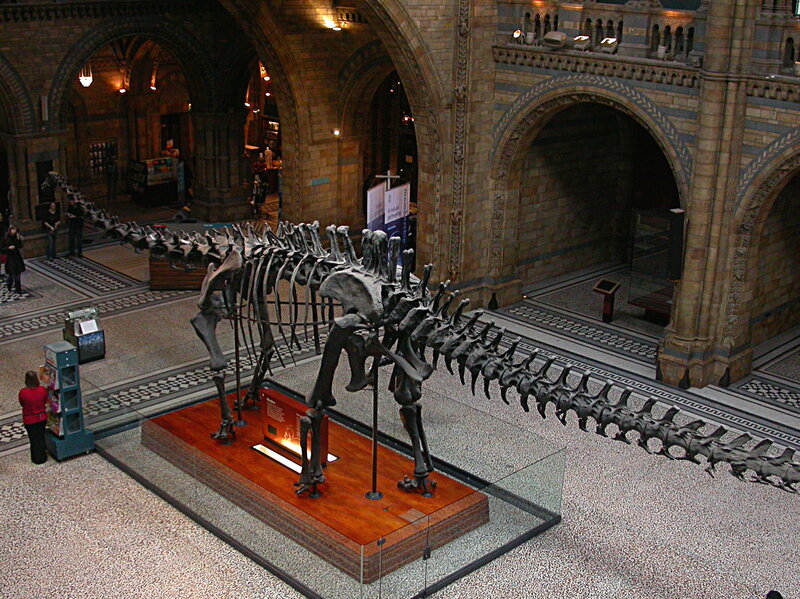 My vote is Diplodocus, probably a cast of the mounted Carnegie skeleton like the one shown here in London’s Natural History Museum (this particular mount turns up here at SV-POW! quite frequently). The cervical rib loops of the anterior cervicals attach near the bottoms of the centra instead of hanging far below them as in Apatosaurus. Also, you can see below that the cervical ribs loops of the posterior cervicals are narrow, as in Diplodocus, but not Apatosaurus (images of Diplodocus cervicals are from Hatcher’s 1901 monograph). This is a cervical rib of a sauropod, and it looks to me more like the slender ribs of Diplodocus than the massive ribs of Apatosaurus. 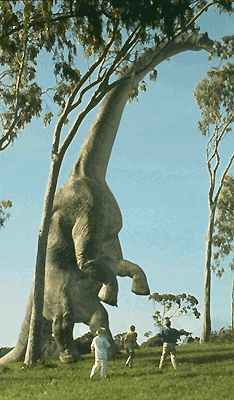 I could be wrong about the genus, but if the bones in the movie don’t belong to Diplodocus they have to be Apatosaurus, and the balance of the evidence points to Diplodocus. 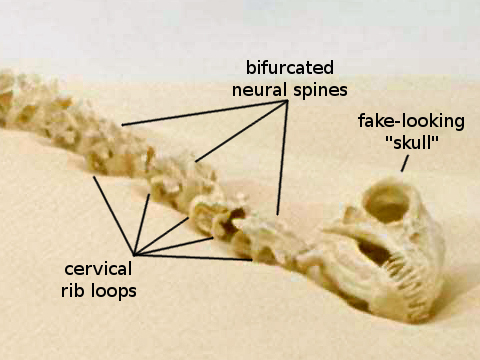 Oddly enough, Wikipedia states that, “The artificial skeleton used for the movie was left there after filming and still lies in the Tunisian desert. 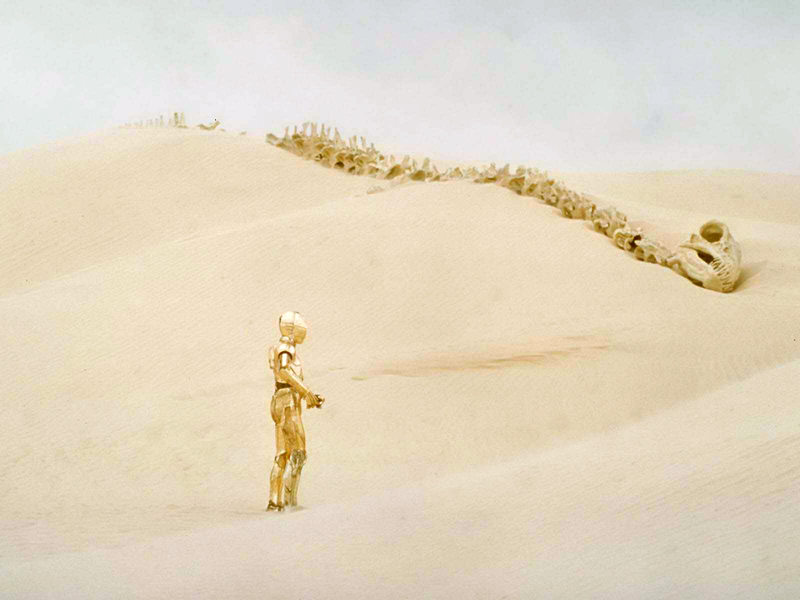 During filming of Attack of the Clones, the site was visited by the crew and the skeleton was still found there. 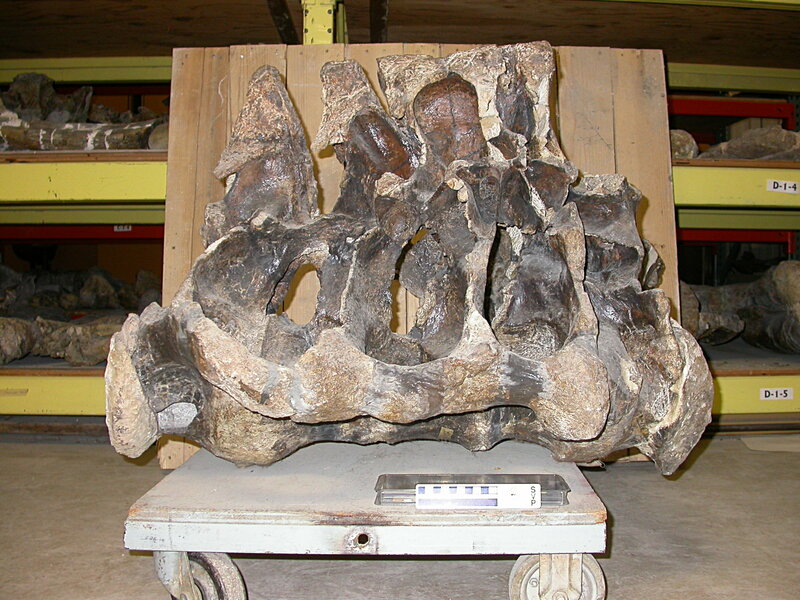 The skull used resembles that of a Diplodocus, a herbivorous dinosaur related to the Apatosaur” (emphasis added). Good call, Wiki-trolls. The “Krayt dragon” locality has been visited, and blogged about, by paleontologist and paleo-blogger Michael Ryan. 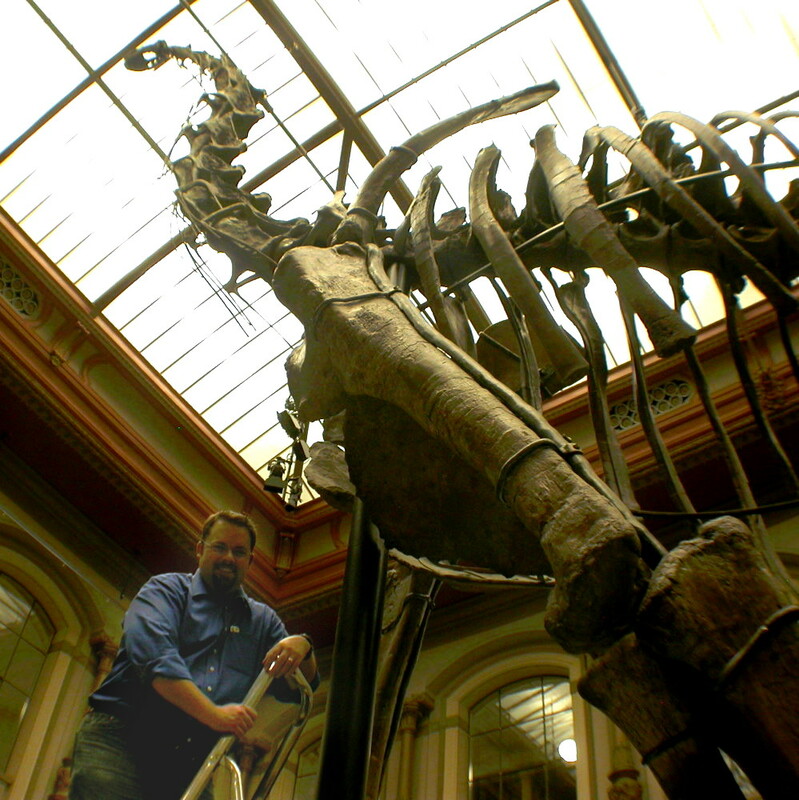 One more thing: Diplodocus and Apatosaurus both have 25 presacral vertebrae. The photo above is not crisp enough to determine precisely how many vertebrae are in the cervical+dorsal regions, but it’s more than 25. Also, none of the dinky anterior cervicals of Diplodocus are visible. 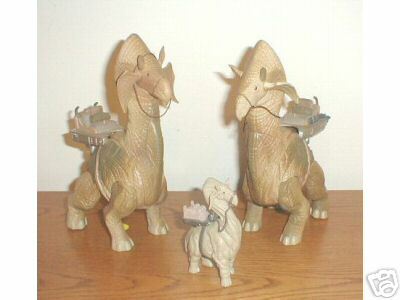 So I think they must have gotten two sets of presacrals (possibly two whole columns) and used only the bigger vertebrae. I wonder what happened to the verts they didn’t use…I’d give a non-essential organ for a cast Diplodocus cervical.